Certain investments are risky while others are safer. Generally, higher the risk higher the reward. Principal protected investments are relatively safe investments. You will learn why. 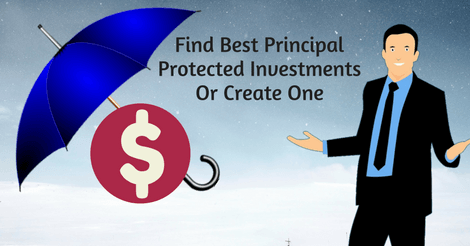 Also, You will learn how to create or find best principal protected plans. Below is a table of contents to help you navigate through this post. Everyone invests to accomplish some financial goal. You will be happy to see positive returns on your investment. But in case the investment fails, you may experience a loss. Nobody likes losses. The mere thought of losing the invested money is detrimental to mental peace. What if you are certain to receive back at least the principal even if your investment strategy fails? Principal protected plans exactly do that. 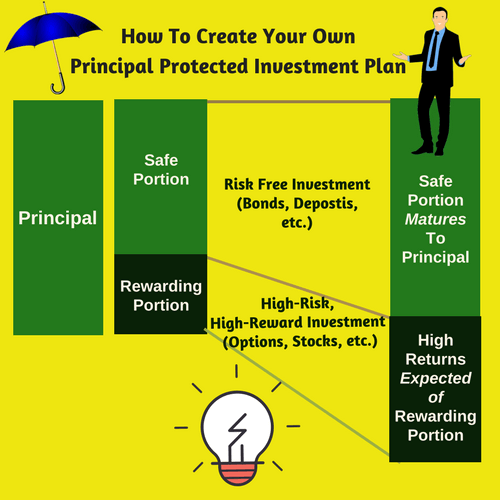 A principal protected investment will guarantee you the entire 100% or at least a fraction (like 50%, 60%, etc.) of the principal. The safety of the money depends upon the creditworthiness of the issuer. Hence, unless you are confident of the issuing company, you should stay away. Note: Those who invested in PPNs (Principal Protected Notes) of Lehman Brothers suffered losses during the firms’ collapse (in the years leading to 2008). Traditional zero risk investments are the ones like government bonds, certificates of deposits, etc. The principal is protected in such investments. So how PPIs are different? The major difference lies in the expected returns. PPIs are slightly riskier than conventional risk-free investments. But they are expected to return higher. There is no universal best plan for everyone. The word “best” is subjective in the investment world. A good plan is one which you understand. You should understand both the structure of the plan as well as the risks. The plan or strategy that you find attractive may not be best suited for another person. There are two ways to zero down your best capital protected investment. The first method is by creating a portfolio strategy yourself. Creation of a custom plan is an easy process. You will see an example which will help you design your own portfolio. The second way is to choose an existing market product. Many top fund providers offer capital guaranteed products. You will see few examples. You will learn how to evaluate and find your best-suited plan. Now you will see the steps to create your “best” capital protected plan. To begin, you should have some information ready. You should know the amount of money you are planning to invest. You should have some basic knowledge of risky and risk-free investments in your country. You should know the time when you want your money back. Typically, capital protected plans work best in upwards of 5 years. For illustration, let us assume you want to invest $10,000 for 5 years. Identify a risk-free investment matching your time-frame (5 years in our example). Generally, in the US many prefer bonds (treasury or high-quality corporate bonds) because they are expected to return higher over other risk-free investments. You can even choose a bank deposit (like CDs) if you are comfortable. The option you choose should have the following quality. For example, assume a corporate bond maturing in 5 years. Let the issuer be of high grade on creditworthiness scale. Let 4% be the interest per year on the purchase price. Now you have to invest a part of $10,000 into the vehicle identified in step 1. Let us call this part as safe portion. But how exactly to calculate the safe portion? You will find now. The safe portion should grow equal to the principal upon maturity. Below you will find a formula to help you calculate the safe portion. In our example, Principal = $10,000, Interest Rate = 4% Per Annum and Time Frame = 5 Years. Thus, you have to invest $8219.27 in the risk-free bond. This money will mature to $10,000 in 5 years. Thus, your principal is protected! After the bond investment, the remaining principal is $10,000 – $8219.17 = $1780.83. We call this part of the investment as rewarding portion. You are free to invest the rewarding portion ($1780.83) in a risky vehicle with high returns. The only limit is your risk tolerance. Since your principal is guaranteed, you can push your limits. Word of caution: Many will advise investing the rewarding portion into “call options”. Option contracts potentially return higher compared to many other assets. But our (Netcials) advice is to stay away unless you understand options trading. Other choices you have are stocks, mutual funds, ETFs, index funds, etc. Assume you are going to invest the rewarding portion of the principal ($1780.83) in stocks. Think of an imaginary company XYZ Corp. Assume you have done the stock analysis and are confident that the prices will rise. Let the price at the time of your buying be $197.87 per share. The total number of shares you can buy with the rewarding portion ($1780.83) will be ($1780.83/$197.87) = 9 shares. Now your portfolio will look as shown below. $1780.83 in shares of XYZ Corp.
At the end of 5 years, you will get back your principal from the bonds. Remaining return (and overall gain) will depend upon XYZ stock performance. Let us discuss two hypothetical scenarios. In both the scenarios, your income is greater than the principal. In scenario 1, XYZ stock performed well. So the return was much greater than the principal $10,000. In scenario 2, the XYZ stock faced 30% loss. Still the return was greater than $10,000 but not as much in scenario 1. Any magnitude of loss in XYZ shares (even a 100% loss) will never hurt your principal. Thus the name Principal Protected Investment! Your learning is this. In case the rewarding portion of the investment fails badly, your return may fall below the risk-free return. 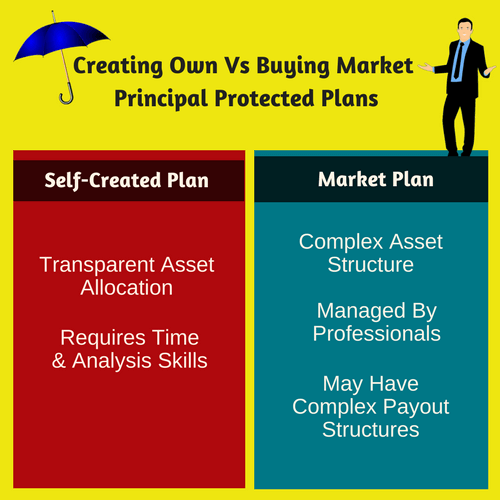 The previous section showed you how to design your own capital protected investment plan. Designing your own plan has many advantages. For example, creating your own strategy will help you monitor and switch assets during the course. There is no better strategy than the one which you understand. But not everyone has the time or skills to create a portfolio strategy. In case you are not comfortable creating your own strategy, you can go for existing products. Major global players like Prudential, Zurich, JP Morgan have different capital protected products for different countries. For example, Prudential has a plan called PGF or Prudential Guaranteed Fund for retirement accounts in the Millennium Trust Company (, a custodian bank). You can check with your financial advisor about the principal protected investments in your country. 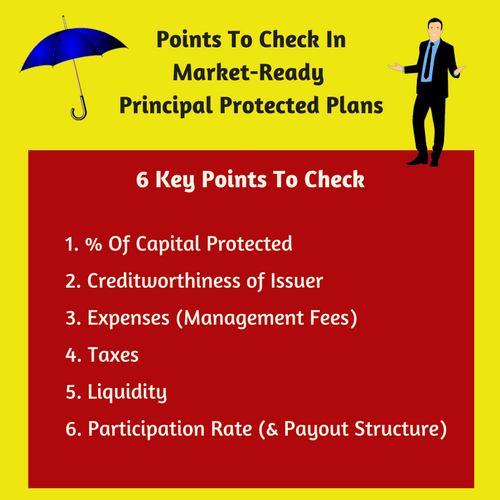 Nevertheless, any principal protected product can be evaluated using the checklist shown below. These points will help you identify the best investment suiting your needs, objectives, and risk tolerance. You should know the percentage of the principal guaranteed. Some plans may protect 100% of your principal while some others may guarantee as low as 10%. Generally, lower the protected principal, higher will be the risk profile. Choosing the best level (percentage) of protection is up to you. Your decision should depend upon the expected returns, risk tolerance, etc. Typically, most principal protected investments will allocate some portion of funds towards equities, indexes or other benchmarks. The return will depend on the performance of those assets. Hence you should have an idea about the structure of allocation. For example, in case of PGF (Prudential Guaranteed Fund). You can find the allocation structure in the fact sheet. A guarantee is only as good as the creditworthiness of the guarantor. You can evaluate the issuer/guarantor by checking third-party ratings, past history, etc. Check in advance for the expected expenses. Expenses may include the fee for the fund managers. Other expenses may result from the nature of assets invested. Most of the principal protected funds are “locked up”. That means you will receive the returns only at the time of maturity. In such cases, there can be imputed interest. In case if a plan pays you interests, you have to pay any corresponding annual taxes. Assume a principal protected fund where you obliged to stay invested for 5 years. Not everyone can predict the future with certainty. In case you choose to exit within 5 years, say 3 years, you may have to pay a penalty. Usually, capital protected plans are illiquid. You cannot easily redeem or sell the products in the secondary market. Before zeroing down your best product, check for the clause governing early exit. Structured notes with principal protection are a type of capital protected investments. If you want to evaluate if those notes are the best for you, you should check a lot of factors. The sec website features a page to help investors to evaluate the structured notes. Few key points (based on SEC website) are the following. Returns on some notes will be linked to an underlying benchmark or index. The participation rate determines how exactly the gains on a benchmark will reflect on your return. In some cases, the return on the principal will be a fraction of the gains of the benchmark. For example, assume a hypothetical structured note linked to S&P 500 index. Assume that the note’s prospectus explains the participation rate as shown below. If the S&P 500 gains 40% or lesser in 5 years, half the percentage gain will be applied to your investment. For example, if the S&P 500 gains 18%, you will receive (18/2 =) 9% on your principal along with the principle. If S&P 500 jumps more than 40%, you will receive 101% of the principal. For example, if S&P 500 jumps by 45%, your return will become 101% of the principal. In case the S&P 500 loses in the 5 year period, you will receive 100% of the principal. Based on the above conditions, the favorable scenario is when the S&P gains but not greater than 40%. Assume you had done your analysis and are confident that s&p 500 will gain up to 25% in 5 years. In sucn a case, our hypothetical note may become your best bet. A more interesting example is found on the SEC website. Such counterintuitive payouts are called as “shark-fin payouts”. We have come to end of the post. Now you should be able to find or create your best capital protected investment. There is a reason why the post began with the section on creating your own plan. The reason is designing your own plan often turns out the best. Three top reasons are the transparency (you handpick the assets). your understanding and the liquidity. But if you rely professionals due to lack of time or skills, market products will help you.